Hurry, He's Hungry is the sixth mission of the Sea Slide Galaxy in Super Mario Galaxy. This mission is a hidden mission accessed during the regular mission The Silver Stars of Sea Slide. Making their way to the cannon, the player will find a Hungry Luma next to it. The Hungry Luma will ask the player to feed it forty Star Bits, which can be collected around the Sea Slide Galaxy. 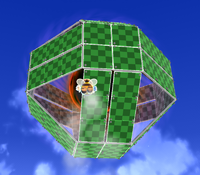 After obliging, the Hungry Luma will transform into a planet made out of Shrinking Tiles, which the player can reach by using the cannon. Upon landing on the planet, notes will appear on each of the tiles and the player needs to collect them all as the platforms disappear underneath them. Collecting all of the notes will cause the black hole in the middle of the planet to disappear and the Power Star will appear in its place. Italian Sfavillotto Ghiotto, Adieu! Hungry Luma, farewell! The Rainbow Notes collected in this mission will play the chromatic scale, as opposed to a Mario theme like most others would. This Hungry Luma is the only one that doesn't create a Launch Star to travel to the planet or galaxy it created, instead making the player use a cannon. This page was last edited on March 2, 2019, at 20:12.